The Website was created in context of the Interface Design Bachelor's degree at the FH Potsdam 2011 by Johannes Tonollo. 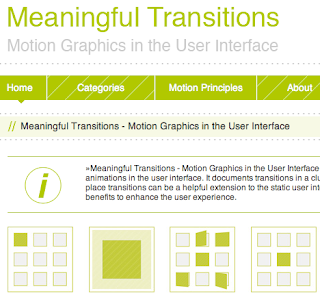 »Meaningful Transitions - Motion Graphics in the User Interface« deals with the use of animations in software user interface. This website documents transitions in a clustered way to show at which place transitions can be a helpful extension to the static user interface, because of cognitive benefits to enhance the user experience.